Consider that question while you’re reading about one of our newest businesses, RECONVERGE, because it’s the most important question most of us will ever ask. Do you feel that sense of belonging at home with your family? That’s the “right” answer of course if you don’t want to be sleeping on the couch tonight… but not all of us have a family to go home to. Maybe you really feel most at home when you’re at work, which is kind of a shame, isn’t it? Others of us have hobbies that we pursue with friends as amateurs out of a sheer passion for them, if not a professional talent, but can we really say those passions offer us a place to belong? In an era where everyone is perpetually broadcasting their epically happy lives to anyone who’ll watch on social media, the dehumanization of one another into a “feed” of trivial meals or sporting events or even life’s major milestones somehow doesn’t quell our deep loneliness… no matter how many “likes” we manage to earn for our efforts. No matter how exciting, rewarding or fulfilling, few of us ever really feel that sense of belonging at our work. Candidly, that’s one of the challenges I wanted to explore in the seven years since stepping down as CEO. That is one of the reasons I am so glad to have Dr. Craig S. Fleisher as part of the team as Chief Learning Officer. As I’ve said before, Aurora as a company and culture is never “finished”. If we are not learning, we’re dying. Craig has forgotten more about intelligence methods than most of us will ever know…and yet he still strives to improve, learn, and push our field and himself forward. And if even Craig has more to discover, then we have a clear mission to help the best and brightest among us discover how much more they have to learn as well. I’d been spending time with clients exploring a concept I’d called “stochasm” which means, in a nutshell, intelligence should occupy the gap between what your leaders think they know about their business and what they actually know. So yes, of course, your job as an intelligence analyst and leader is to create new knowledge, but it’s also to disabuse your clients of their false assumptions. Only by closing this stochasm can you truly help them stop asking the wrong questions and start asking the right ones. We called this role, Provocateur-in-Chief, aka, the G2… but we’ll talk more about that tomorrow. RECONVERGE, the word, emerged in 2012 as a compound neologism of my own imagination in trying to describe a context where the best and brightest people I knew could come together and discover from one another how much more they had to learn. RECON – short for reconnaissance or the engagement of the whole workforce in the intelligence mission – refers to what we all try to do every day, insights and analytics people supporting business leaders to drive strategy, innovation and growth. VERGE is about the “brink” or “edge” or “precipice” that precedes any major event… filled with anticipation. And of course, if CONVERGE means “coming together” then RECONVERGE must mean “to continue coming together” as often as possible… because it’s where you belong. Like most of us, I’ve been a casual member of social networks, clubs and community groups of all kinds over the years, but few of them have endured in terms of my membership. We wanted to do something different… something new. How exactly do you connect with the people that will help you feel like you truly belong? Where do you find your tribe? Most of us never do; that’s why it’s so hard to cope with. 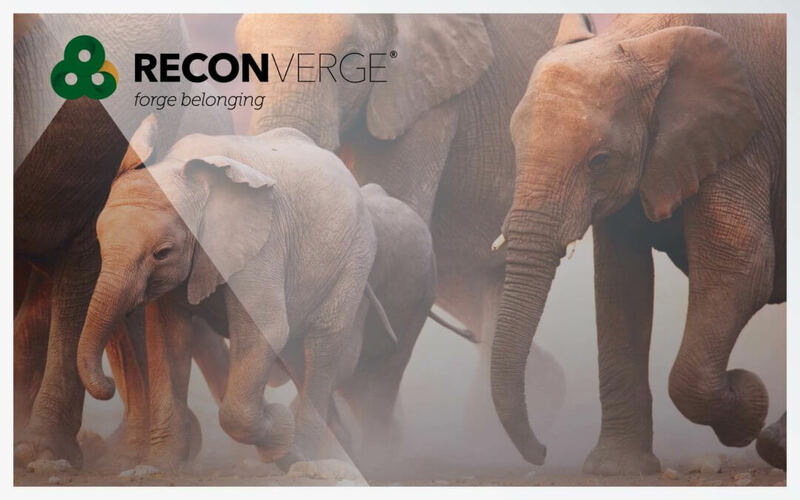 I wanted RECONVERGE to act as a rendezvous point for the best and brightest to contribute what they know and love to others of similar mind and heart. Our IntelCollab Webinars (short for Intelligence Collaborative), which started as a way to inform insights and analytics professionals about the “how to” techniques of doing the technical work, started in November of 2012 and the archive now numbers more than 100 recordings to choose from. IntelCollab 1.0 will be getting a major pivot around its fifth anniversary to an exciting new brand promise that, if you liked the original IntelCollab, the 2.0 version is going to blow your mind. Insight Circles are the local edition of RECONVERGE that I wanted to use as a way for people to support each other in-person in their local, face-to-face communities. But it wasn’t until very recently that we learned it wasn’t by making those groups big enough that would be the route to adding value for participants. It would be by making them small enough for people to truly care about and for one another. The only rules are: (1) If someone can’t make it, you’ll reschedule; and (2) No two people from the same company allowed. Every so often, you bring a buddy from work that can divide off with their other buddies in attendance at that session to form a new Insight Circle. Pretty neat, eh? Finally, the flagship offering of the brand – our RECONVERGE:G2 Intelligence Leadership Symposium – will be entering its seventh incarnation April 24-26, 2018. We’re upgrading yet again to the awesome Fluno Center at the University of Wisconsin – Madison for the most intense 3-day intelligence event we’re able to produce. There will be exciting changes to the format and new ideas that we think you’ll love as much as we’ve loved creating them. I’ll be sharing more about the G2 meeting in tomorrow’s final blog post in Aurora WDC’s rebranding series. Meanwhile, mark your calendars for April 24-26, 2018 as we hope to welcome you in person to Madison in six months to truly forge belonging together with us as we work to serve business leaders everywhere in their pursuit of strategic innovation and growth priorities in markets around the world.